TL866A Bios Programmer is Minipro tl866a usb full Programmer. Super MiniPro TL866A EEPROM Programmer version is V6.5. TL866A universal programmer Support 25 Flash OTP program. 1. is the newest model of True USB Universal Programmer series from China. 8. Ideally suits the portable/convenient applications that includes: car automotive field ECU chip tuning, airbag reset, mileage, satellite devices, BIOS refreshing, xBox, Wii gaming machines EPROM duplicate, PIC/MCU development, newer laptop technology and newer desktop PC etc. 9. 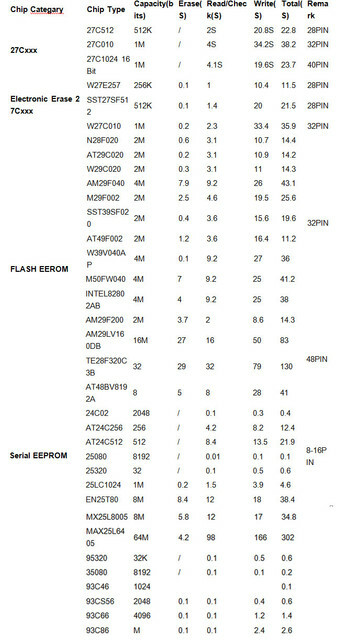 It has outstanding performance which supports the devices that other similar products are not capable of supporting: such as 25LF SPI series, PSOP44, TSOP48, 25VF SPI series, PLCC84, SST39VF3201, TE28F102, 27C1024, 27C1028, HD6475, 29F800, 29LV800.